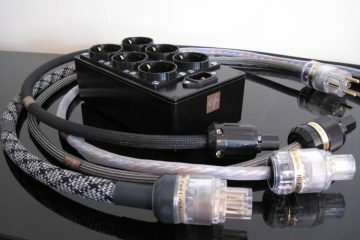 All connectors were tested in combination with their own same type Belden powercable, in each case provided with an imitation Oyaide gold plated IEC connector. 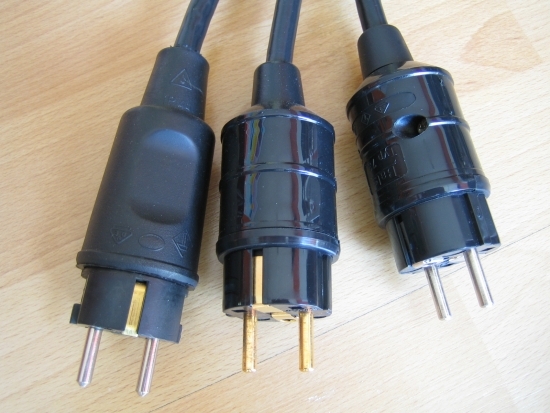 Each cable was manufactured in the same way, plugged in for same phase and burned in the same duration. 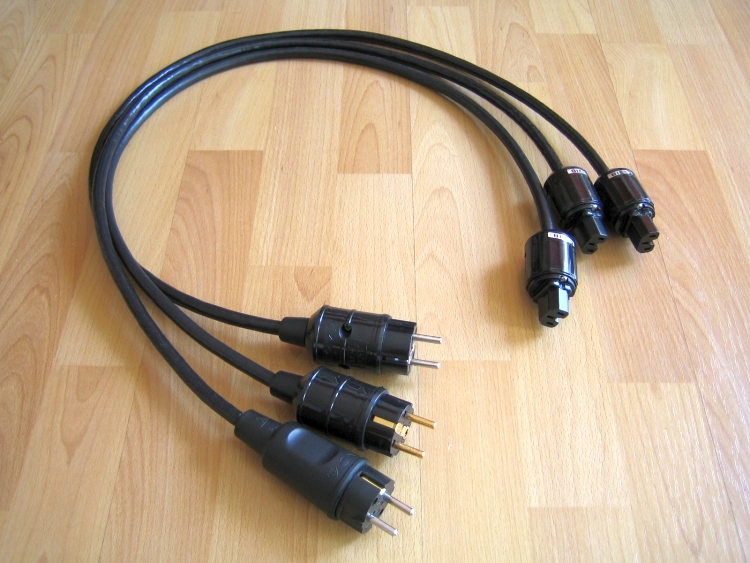 During testing only one cable at a time was connectod, each time in the same position of the extensionblock. A Wadia 861 cd player was used as a source, which was well-run in and kept warm at all times. First connector to judge was the well know and much used Kupp. Familiar sound, nothing wrong with that. Or so I thought. Then I swapped for the cable with the Bals connector. Surely this would be about nuances, right? Wrong! The difference was very obvious. A thick metallic layer was removed, revealing a much more natural, organic sound. Everything was a lot more supple but not at the expense of openness, speed or detail. The highs were still very open and airy, but no longer brittle and now way more natural. And interestingly in spite of the polished sound, not once was this connector sounding boring. Going back to the Kupp was like torture for the ears. I now know that it has a very unnatural emphasized high frequency range. 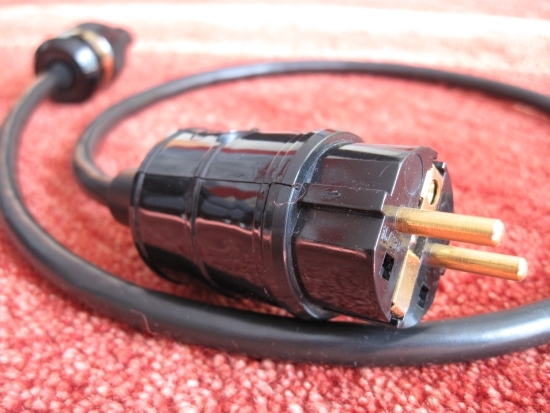 Now it was time for the Hifi Tuning Gold II schuko. Again the high frequencies became more natural, better differenciated, and so does the midband. There is more room for tiny sounds to develop instead of them being crammed against each other. 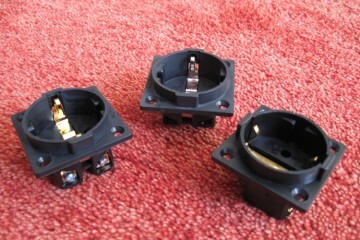 This connector is even more natural and less electronic than the Bals, on which it is based. There’s more romance in the air! Apparently the gold coating does have a large effect. But the sound is also less “spectacular” or powerful, and a little less explicit in the highest highs. The Kupp connectors really aren’t fit for use in a high resolution audio setup. Especially not in a setup such as mine, which has Martin Logan electrostatics. On these speakers the edginess of the Kupp is way too obvious. In specific setups however, that tend to the dark or are less open and forward, the Kupp can still be fine. Just look out for any edginess, as this could be caused by the connector. 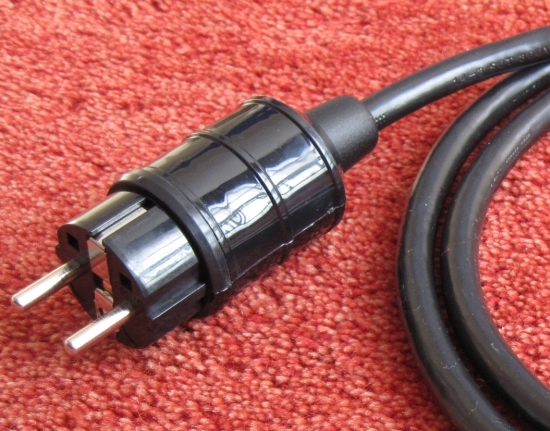 The Bals is a very fine quality connector at a very friendly price and this connector in principle just has no flaws. 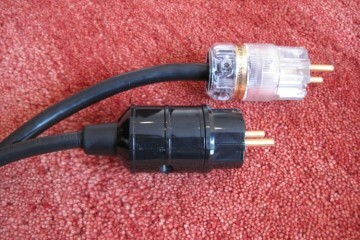 The Hifi Tuning Gold II is the better connector but it has to be applied carefully. Use it only if your setup has sufficient clarity and you’re searching for more naturalness, not spectacle. When replacing connectors, try not to do them all at once. Balance is everything in audio and it’s all too easy to shift the sound too much in one direction. For example, your setup may even need the extra edge of the Kupp if you’ve unconsciously already compensated for its brightness in your system by other means.